For all travel and photography lovers, here is a chance to win one of the three photography expeditions. Four Seasons is helping to inspire wanderlust this season with Focus on Four Seasons, an Instagram contest that emboldens people to keep their travel adventures alive. 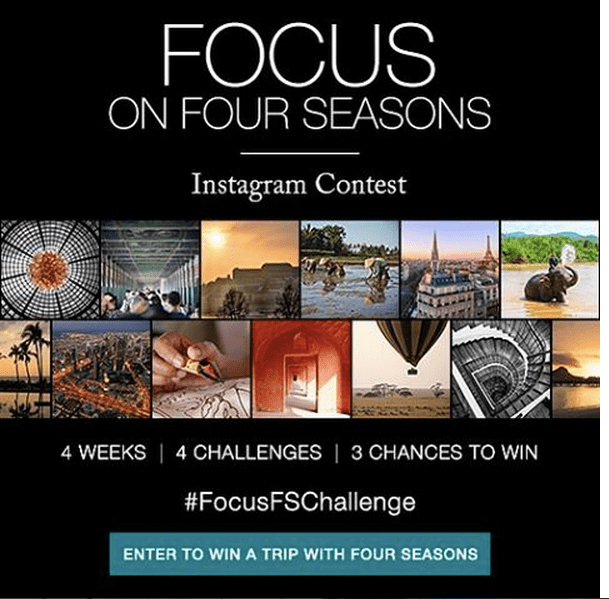 Four Seasons is giving Instagrammers the chance to win one of three getaways by completing four weekly photography challenges. Design and Architecture : The 1st challenge is to capture the beauty in design and architecture through your lens. The challenge encourages showcasing the splendor and details of interior and exterior design. Local Culture : The 2nd challenge, launching on Thursday, is about capturing the heart and spirit of local culture. Photo options for the challenge are endless and could range from city street art to village marketplaces. Nature’s Wonder : The 3rd challenge is about showcasing the beauty of nature’s wonder. Mother Nature can shine through many different styles and seasons whether it is a sunny beach or a snowcapped mountain. Me, in the Moment : The 4th and final challenge is all about YOU, in the moment. Present yourself in your personal paradise, in a moment that makes you shine! 1. Share one photo for each of the four challenges on Instagram using the #FocusFSChallenge. 3. Follow @FourSeasons to see if you were chosen to win one of three amazing getaways! Open to legal residents of the United States, Canada (excluding Quebec) and the United Kingdom only. What are you waiting for , take out your camera and share your best shot. This post is part of Four Seasons #FocusFSChallenge campaign.